In this paper a great number of mechanical relaxation spectrum experiment results in the mixed state of high Tc superconductors have been summarized. 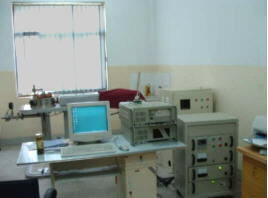 A new low frequency mechanical relaxation spectrum apparatus have been shown. We pointed out that the mechanical relaxation peaks are attributed to anelastic relaxation processes and the transition of rigidly pinned FLL into a depinned state. The mechanical relaxation spectrums methods included ultrasonic attenuation (high frequency) and internal friction ( low frequency ). These methods are nondestructive testing, a powerful tool for studying the properties of the flux-line lattice (FLL) in the mixed state of high Tc superconductors. They are among the most extensively study aspects of high Tc superconductivity. The different structure of the flux-matter (or vortex matter) such as lattice and glasses, can be moved under the influence of the Lorentz force. This leads to dissipation and in these conditions, the critical current density is very low. Fluxon confinement ("pinning") prevents this motion and then jc can be substantially increased. Therefore, to improve jc, the optimization of the pinning of vortices is the decisive factor. Novel vortex phases, such as muliquanta and composite vortex lattices, vortex fluid coexisting with vortex solid, driven vortex lattices, entangled vortex matter, etc., will be studied experimentally. These phases will be modeled by using modern theoretical and numerical techniques. The fundamental research in the framework of this program will form the basis of the advanced knowledge of the vortex matter in superconductors and will also be of importance to other scientific fields including superfluidity, turbulence, liquid crystals, and plasma physics. In the literature the experiment results of mechanical relaxation spectrum in high-Tc superconductors have been summarized by one of authors. Table I summarized the type of results obtained [2-9]. High-frequency wave propagation methods (ultrasonic attenuation methods). Ultrasonic experiments were performed on sample with the lowest dimension along the crystallographic c-axis. Standard pulse echo technique was used with two LiNbO3 transducers. Low frenquency mechanical spectrum method: recent torque magnetometry is shown in Fig2. Recently a new low frequency mechanical relaxation spectrum apparatus have been studied and produced by us. Its circumstances will be gone into detail elsewhere. This apparatus is shown in Fig3. The acoustic measurements have yielded a great number of results that have been variously interpreted as due to thermally activated depinning pheonomena, to melting of the FLL(flux line lattice),to critical behavior indicative of phase transitions and other possible mechanisms. Type-II superconductors in the mixed or vortex state (the term 'vortex' and 'flux line' are used interchangeably), i.e. in the presence of magnetic fields in excess of Hc1,display energy dissipation whenever a force (electrical or magnetic) causes a displacement of vortex lines. This dissipation is, naturally , of great technological and scientific interest; the former primarily because it limits the current carrying capacity of such superconductors, and the latter because many features of interaction mechanisms , pinning of vortices and the nature of the various FLL stases are not completely clear and current views are sometimes controversial. In this paper we pointed out the mechanisms of the ultrasonic attenuation peaks and the mechanical dissipating peaks in the mixed state of HTCS (high Tc superconductors). First, a large number of experiments show that mechanical relaxation peaks are shown in the following two types: bell shape and ?shape (very sharp peak). The former shape[2,5,7,8,9 ] is attributed to anelastic relaxation processes, the traditional thermally activated relaxation type; the latter shape[3,4,6 ] is attributed to the transition of a rigidly pinned flux-line lattice into a depinned state. Second, the vortices that have been pinned are the center of tackling the problems. The pinning of the flux line lattices interacting with CuO planes and randomly distributed point defects are studied. The pinning by point defects is described in terms of the collective pinning model. From the viewpoint of thermodynamics, it is more favorable to place a flux line between superconducting layers (CuO plans in HTCS) than at one of them. This effect is usually referred to as ' intrinsic pinning'.The pinning by point defects (bulk pinning) destroys the long range order in FLL. Third, since the elastic constants and wave velocities are directly related to the second derivative of the Gibbs free energy with respect to strain, such measurements constitute an important probe of phase transitions. The free energy of pinned FLL per unit volume presents as a sum G=G3D+G2D+Ge, where Ge is the FLL elastic energy, G3D bulk pinning, G2D intrinsic pinning. In fact, many of the low frequency peaks are found to occur at higher temperatures than the high frequency ones. These results indicate that the processes observed by acoustic measurements are not the traditional, thermally activated relaxation type. This excellent agreement between theory and experiment excludes other possible explanations (such as, for instance, FLL melting ) of the attenuation peak. We therefore conclude from these results that for sufficiently small driving force, flux-line motion is mainly diffusive in character. The further discussion shall be made on the theory of dynamics of FLL.